Start spring early with a brightly colored spring sign! 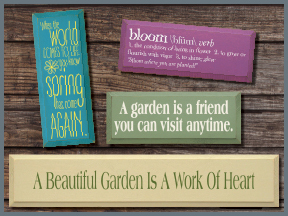 Add a sign to your garden decor, or brighten up your home for spring, we have a variety of cheerful, solid wood signs! With over 40 colors to choose from, your solid wood sign from Sawdust City will look great anywhere! Spring is here! We're so excited we wet our plants!